The two cars here have a lot in common. They are both grown up hatchbacks, both target the young audience, and despite using the 'country' tag, both come without all-wheel drive. They are even priced similarly. And for this story they are both finished in a shade of brown. The V40 by Swedish carmaker Volvo impressed us so much last month that it actually went on to win the comparo against the BMW X1 and the Mercedes-Benz B Class diesels. We can't think of any other vehicle that's better in this segment. 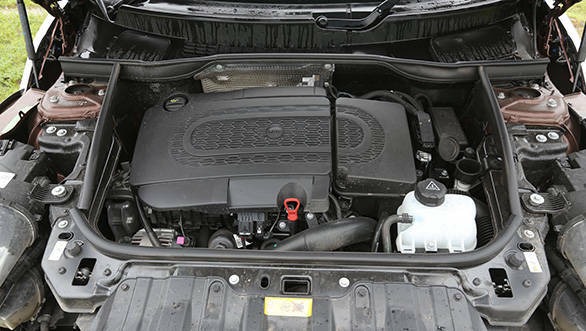 But hang on, Mini has started to locally assemble the Countryman diesel. This has made the Mini more affordable and thus a more potent threat to its competition. In this case, it's the Scandinavian beauty V40 that's currently the segment's best. 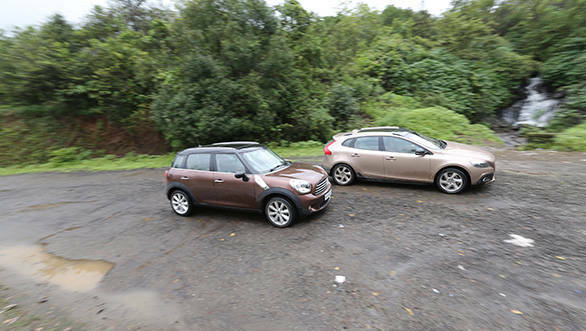 Can the Mini Countryman dethrone it? Both cars get a lot of attention for obvious reasons. The Countryman features typical Mini styling that puts a smile on everyone's face while the V40 gets Volvo's new age design that can give even Range Rover Evoque owners a complex. The Countryman in diesel form however is slightly different to look at. That's because it misses out on sporty details like the split front grille, air scoops and dual exhausts from its Cooper S sibling. It still manages to look sporty thanks to the large 18inch wheels and contrasting colours. And if you want to, you can even opt for racing stripes and a host of other accessories to get an even more exciting feel. The V40 on the other hand doesn't need any additions and it looks stunning as it is. 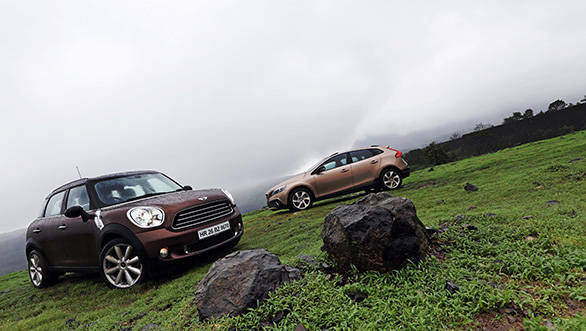 The car is longer, though shorter in height, than the Countryman, giving it a more dynamic stance. The styling is one of the best to come out from Volvo's designers and the modernity is very obvious on the car from any angle. Only the wheels look a bit conservative and that's because we are comparing it to the Mini's 18inch wheels and the large Volvo R-Design carbon finished wheels that are sadly unavailable in India. The Mini and Volvo may follow a very different design language but are definite attention magnets. Step inside and it's the same story. For the Mini, the funky theme continues for the interior too while the V40 prefers to go the classy way. The Mini's frisbee sized centre-mounted speedometer catches one's attention instantly. It not only displays speed but cleverly houses the car's infotainment screen as well. The interiors are unconventional, yet user friendly. The controls for instance are not buttons but toggle switches. It isn't common to see such switches but are easy to operate. 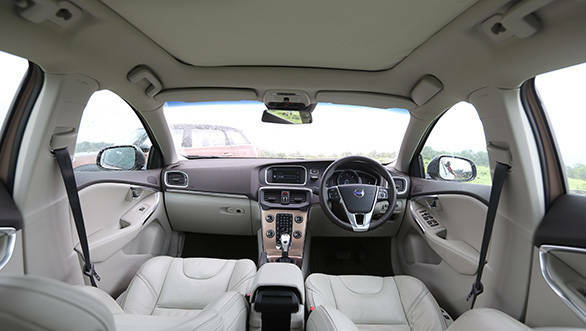 However, for a car that costs above Rs 30 lakh, one does expect a lot more comfort features. The driver seat can only be manually adjusted, the rear view mirror doesn't get auto adjust and there is no reverse camera. The V40's classy interior takes a more serious approach. It is built as well as the Mini but feels more premium thanks to the use of modern elements. The gear knob for instance is illuminated while the speedometer is a full TFT screen with the option to choose between three colours/themes based on your mood. 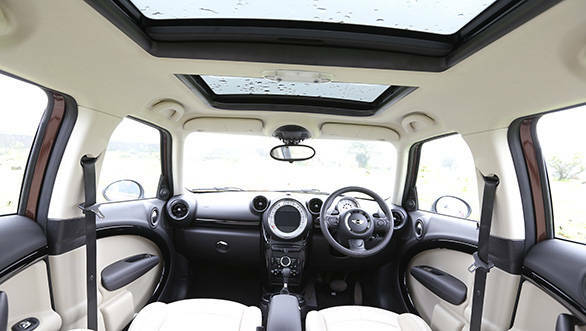 The lights inside can also be changed but is nowhere close to the Countryman's mood lights that give the impression of being seated in a lounge. As mentioned before, the Volvo is longer than the Mini so one does expect more space inside. It is not the case though; it is evenly matched in the front while rear kneeroom is just slightly more. In terms of boot space, the V40 offers much more space. 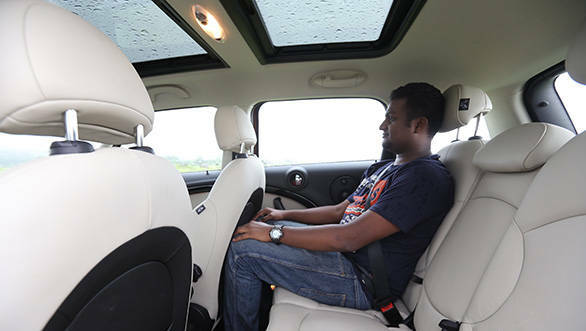 The Countryman too gets foldable seats and because of the extra height can take in taller objects. When it comes to features, the Volvo can put cars from higher segments to shame. There is just one fully loaded model that comes with the latest bells and whistles such as a high resolution reversing camera, ventilated seats, park assist feature that can steer the car on its own into a parking spot (which worked flawlessly with minimal effort). Safety is priority in a Volvo, and the V40 gets seven airbags, including a knee and pedestrian airbag. Then there is the city safety feature that automatically detects a possible collision and prevents it. 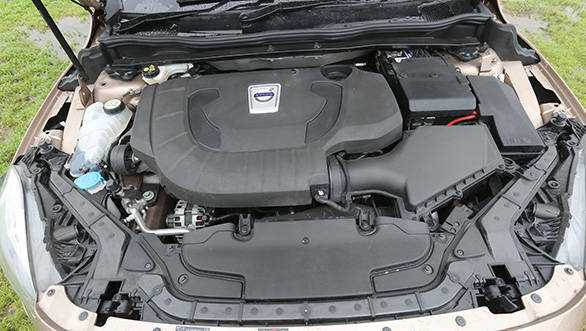 Both cars are powered by 2.0-litre diesel motors but the Volvo gets an additional cylinder in the form of the inline-5 D3 engines seen before in other Volvo models. The Mini borrows its engine from BMW, this is the same motor seen in the X1 and 3 Series but with a lower power output. Maximum power of 112PS at 4000rpm is not so high and 270Nm of max torque is produced at 1750rpm. The Cross Country produces more power than the Countryman despite it not being the most powerful in its segment; maximum power and torque being 150PS at 3500rpm and 350Nm at 1500rpm respectively. However, out on the road in the Countryman, throttle response is impressive because of good low end torque and minimal turbo lag. The only downside to this engine is noise and poor top end performance. The ton comes up in 11.08seconds (quicker than the claimed 11.3s) which is quite respectable for an engine that puts out 112PS. A six-speed torque convertor similar to the older X1 does duty. Shifts are seamless but it isn't quick. The newer 8-speed transmission from the current X1 would have been a better choice. The D3 engine in the Cross Country is much more refined and engine noise and NVH levels are better muted. The motor produces more power but since power delivery is more linear it feels slower than the Mini initially. But kick down performance, mid range and top end grunt is much more impressive. This shows on the performance figures, 100kmph comes up in 9.54 seconds and the top speed is an indicated 194kmph (close to 20kmph more than the Mini). The six-speed torque convertor offers smoother shifts and is quicker too. In terms of efficiency, the Volvo overall fuel efficiency figure is better than the Mini despite being more powerful. The city and highway figure being 11.2kmpl and 19.2kmpl respectively (the Mini returns 10.9kmpl and 19.3kmpl). Minis have always been good handlers and it's no different in the Countryman diesel. Despite a heavy front end thanks to the oil burner, there isn't much to differentiate from its petrol Cooper S sibling. 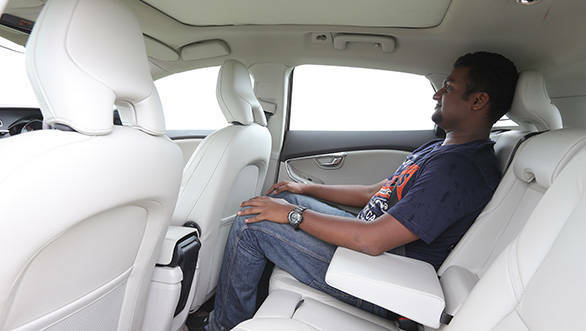 The driving position is involving and the connection between the driver and the car is just perfect. Turn in is sharper than the Volvo and the go kart feel is evident. Independent suspension overall is slightly stiff but then this setup is to aid dynamics. And like the X1, it too has a crashy ride, higher profile wheels tyres with smaller wheels should help. The steering is also slightly heavy which is good in terms of handling, and if needed more weight can be added by pushing the sport mode button. However the steering feels vague at times, the heavy steering also means driving in city traffic for a longer duration results in driver fatigue. The V40 is more relaxed in comparison, the car also features independent suspension but it isn't as stiff as the Countryman. This doesn't mean it can't handle well; it is actually quite composed and is good fun around corners. The ride is firm and it drives better over bumps and undulated surfaces. The steering is lighter and there is sufficient feedback, and like the Countryman the steering weight can be adjusted by simply pushing a button but only when the car is not moving. Driving in town is effortless and is never demanding on the driver. This along with the comfy ride and refined motor gives the Crosscountry an advantage. The Countryman is finally more affordable than before (even more than the Cooper hatchaback) and is also available in diesel. However it only makes sense to someone who is a Mini fan and only wants it in diesel form. Apart from dynamics, the Crosscountry scores over the Mini in every other aspect. It offers a host of extra comfort and safety features, is more powerful and at the same time offers better fuel economy as well. Volvo doesn't have as many dealerships as Mini but it is increasing and if you live in a big city, you won't be complaining. 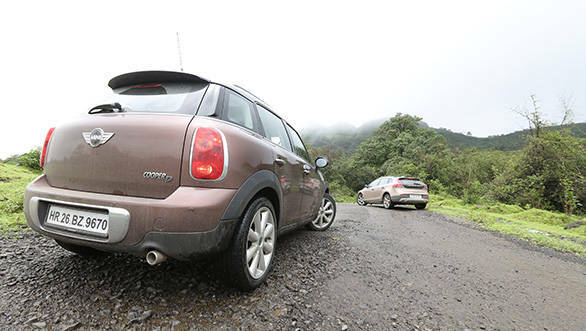 At Rs 34.3 lakh (on-road Mumbai), the Crosscountry is also more affordable than the Countryman, Rs 1.6 lakh cheaper to be exact. The Volvo V40 Crosscountry wins this comparo and as a result retains its crown.